Black smoke from burning e-waste and the acrid smell of sewage filled the air as Carson Watts (Oakes '13, sociology) strode through the slums of Old Fadama in the capital city of Ghana. Home to nearly 100,000 people, the shantytown is a collection of dusty alleys, wooden shacks, and a sanitation system that consisted of trash haulers and latrine operators dumping their loads of waste into a fetid lagoon at the edge of the slum. A nearby e-waste disposal site was the reason for the black smoke. Watts, who hopes to get a Ph.D. in sustainable development, was soon talking to residents and government officials in an attempt to understand why such unhealthy conditions existed and what could be done to improve them. Old Fadama's residents said trash bins and public toilets would solve much of the problem—but the government only wanted the slum to be erased. Make something happen, the residents implored Watts. "I felt a great sense of responsibility," said the 24-year-old community college transfer student who went to Ghana through UCSC's Education Abroad Program. Now Watts is not only writing his senior thesis from research gathered during the five-month trip but he is also planning to write a position paper to send to Ghanaian officials outlining what he discovered. "It was eye-opening to see the poverty there," Watts said of his time in the slums, "but it also confirmed my career path." One day, Watts hopes to work in the sustainable development field both at home and abroad. Meanwhile, he has already lined up his first job out of college. He will be working for a grassroots campaign that fundraises for environmental and social justice issues. A young man who grew up in a working-class family in the Sierra foothills — and has worked summers as a river guide — Watts also is passionate about the environment. 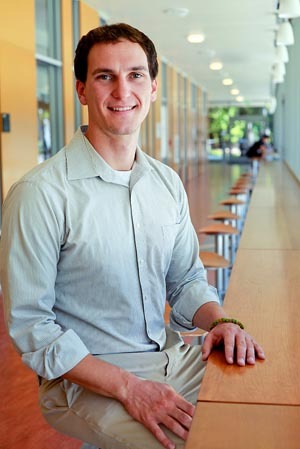 At UCSC, he coordinated a green building campaign for the campus's Student Environmental Center, constructing an educational cob oven and helping develop a green audit system for buildings on campus. That dedication to social issues and public service is what landed Watts the $2,500 Gabriel Zimmerman Memorial Scholarship at UCSC recently. The award was established in honor of Gabe Zimmerman, who died in the January 2011 shooting that killed five people and wounded U.S. Congresswoman Gabrielle Giffords. Started by two UCSC alums and garnering more than $90,000 in contributions, it is given to a student who is dedicated to social issues and working to better the world. "To be in higher education is to be in an incredible position of power to do something," Watts said. "I recognize I can make a difference. To see a problem and do nothing would just be a crime."